Travel North along the Grand Union Canal: SP9213 : Grand Union Canal: Marsworth Flight: Lock No 45 and dry dock. 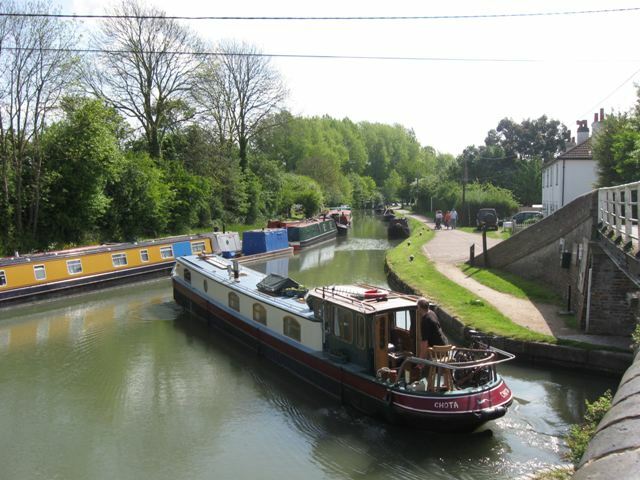 Travel West along the Wendover Arm: SP9213 : Wendover Arm: Bridge No 1. SP9313 : Grand Union Canal: Narrowboat Moorings at the Tring Summit, Bulbourne. SP9313 : Grand Union Canal: The Bulbourne Workshops. .
SP9313 : Grand Union Canal: Bulbourne Bridge No 133, near Tring. Additional General Information SP9114 : Canal and Reservoir Information – Tring Area. The narrowboat “Chota” leaves the Wendover Arm and turns to go east past the moored boats at the Tring summit. © Copyright Chris Reynolds and licensed for reuse under this Creative Commons Licence.